Usually we have a fire blazing in the family room, but this oddly warm weather made that superfluous. Our gift card swap was amusing…all the guys wanted the Bass Pro Shop card! The girls were jockeying for the Macy’s and Michaels cards. I got the Macy’s card! Dad uncorked a lovely Riesling for all the ladies to enjoy (yay!). I even had a glass and managed not to cry or turn red (my normal reaction to wine). We opened most of our gifts before I couldn’t wait any longer…I had created something special for Bam and Papa. 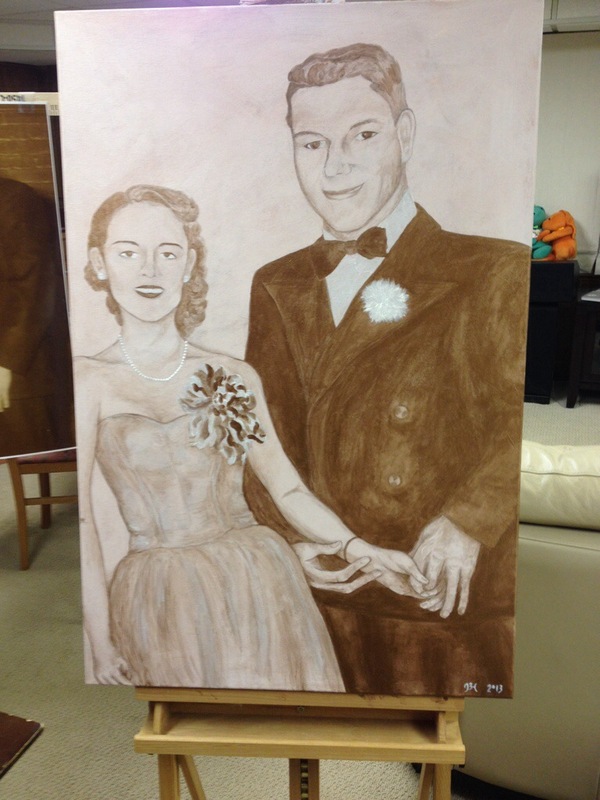 It is the best painting I’ve ever done and the only human portraits I’ve ever painted. 64 years ago, Bam and Papa attended his senior prom. He was two years older then her, cutting an absurdly dashing figure in his suit and bow tie. Bam was truly stunning, with fair, delicate features akin to Grace Kelly and Norma Jean. I always loved their prom photo, so, four or five years ago, I asked my mother to make a copy of the image for me. I prepared a tall gallery wrapped canvas, giving it an iridescent soft bronze-y pink background. And then…the photo vanished. Fast forward four years, and I’m cleaning out boxes in the music room. I open a neglected storage box. Lo, the phantom photo was on top of hundreds of other snapshots, protected by a zipper bag. I knew it was too tiny for me to accurately proportion onto my canvas, so I enlarged the photo at Walgreens. It took three intense days and all my courage to gently draw and then brush their faces and clothing to life. Iridescent white and a subdued rosy bronze were the perfect compliment to the delicate background. 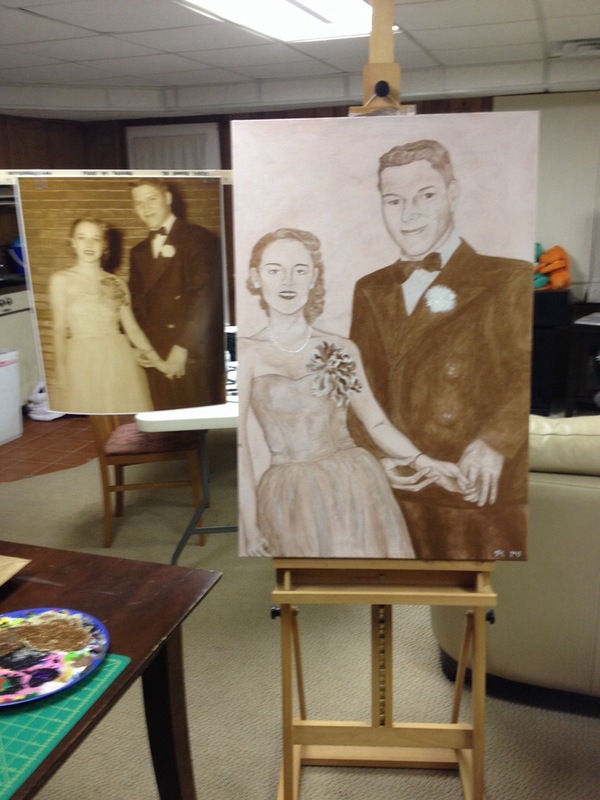 The painting looks almost sepia toned, slightly more lively than the black and white original. I cried quite a bit painting this…tears of joy, thankful for my grandparents, their love, our family and my God-given talent. Never did I imagine that I could create something so beautiful, heartfelt or recognizable. I wanted my entire family to see it when they opened it because that image represents the starting point of our family, of all the amazing things to come. I was too abashed to look at everyone though, when it was unveiled, afraid I’d start crying. There were quite a few tears spreading throughout the room. I make nearly all of my Christmas gifts now, and I’m glad I do. They carry so much meaning and heart. This gift was one of my favorites, since Bam and Papa have given us the gift of family all these years. Merry Christmas isn’t enough. Jubilant Christmas! Triumphant Christmas! Exultant Christmas! Hoping everyone has a holiday blessed with family and friends! And the knowledge that we have so very much to be thankful for! 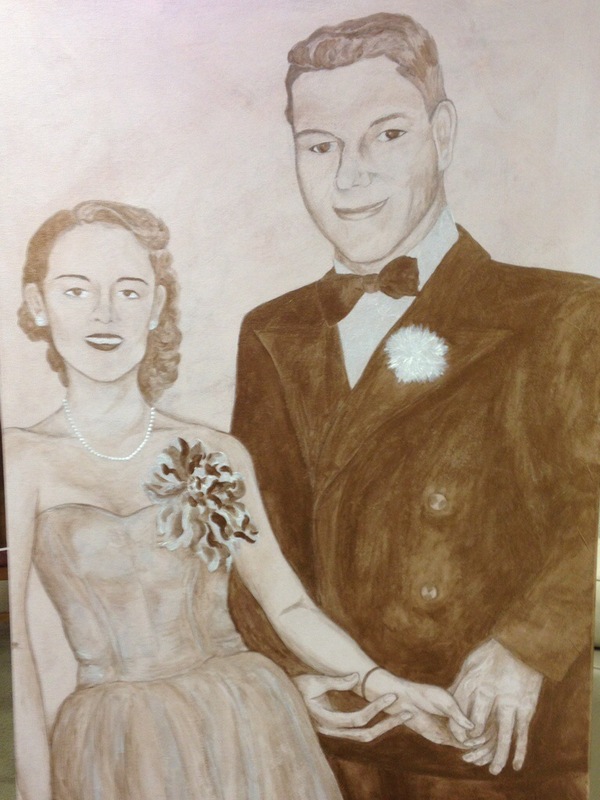 This entry was posted in art, Bam, Christmas, drawing, Family, Gift ideas, grandfather, grandmother, holidays, love, Painting and tagged Bam, Christmas, Family, gift, grandparents, Love, Maggianos, Painting, Papa, prom. Bookmark the permalink.